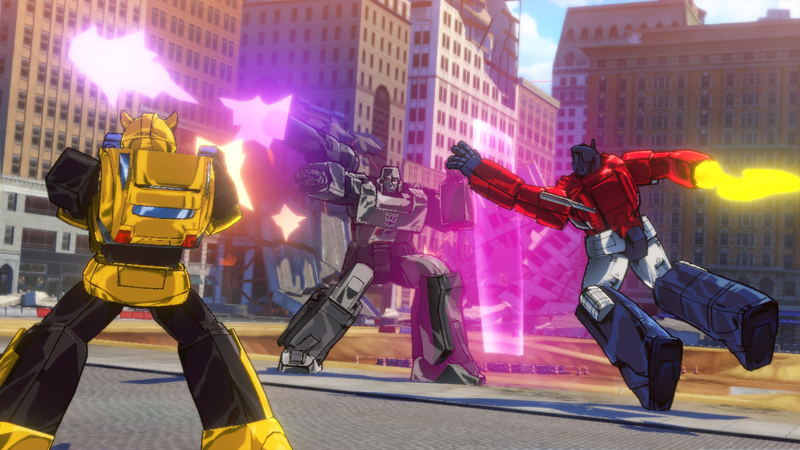 Transformers Devastation is the newest Transformers game in a long line of previously mediocre productions. But thankfully we’re in for a treat. This time round the Insecticons and the Decepticons are causing trouble for Earth, with Megatron planning to utilise plasma energy to turn the planet into a large metal rock, devoid of organic life. So it’s up to Optimus and his trusty Autobots to shoot and punch their way to victory. The story is fairly straightforward: Stop Megatron. Save Earth. So no pressure. Whereas previous games have followed the Michael Bay movies, or have revisited the Transformers’ home world of Cybertron, Devastation keeps things very much in the past. And by that I mean it turns you into a grinning twelve year-old again. For those looking for a nostalgic stroll down a metallic lane, you won’t be disappointed. This iteration has managed to completely capture the original Transformers look. In fact, PlatinumGames have done such a good job it’s like watching the original Generation One cartoon and then taking over. Characters reflect light sources, and weapons flash and glow just as they did in the original cartoons. Though the visuals do falter in some areas such as the buildings and elements of the surrounding environment, the overall look of the game is superb, and the music and voice acting is just as nostalgic as the 1980s cartoons, with the likes of Frank Welker (Megatron) and Peter Cullen (Optimus Prime) taking us right back to our childhood. Gameplay is a fast-paced combination of robot-bashing action and combat focussed vehicle use, with combos being a constant means of dishing out the pain to enemy combatants. And to top it off you can use a variety of characters, such as Grimlock, Bumblebee, Wheeljack, Sideswipe and Optimus. The controls are fairly easy to use, though the camera angle does get in the way sometimes. But I think it’s fair to say that Devastation is an enjoyable, button-mashing beat-‘em-up with plenty of opportunities for any Transformers fan to shoot and transform their way to happiness. Each level also involves a different approach to defeating certain opponents, or getting past certain barriers that block the city streets. These are a fun way to introduce the player to new moves, all of which can be utilised when encountering regular bad guys. Upgrades are available throughout, though the impact of each upgrade is hard to rate as far as effectiveness is concerned. Though you can increase the number of weapons each character carries or uses. The need to transform has been brought in as an effective way of tackling Decepticons, though these are limited when compared to ‘robot’ mode. Though Devastation is a truly superb trip down memory lane, there are some repetitive elements to the combat. Its overwhelmingly linear journey is both incredibly helpful and a hindrance. Each encounter with the Decepticons is presented in stages. Usually several generic bots turns up, followed by someone more difficult. But despite this seemingly simple set up, standards don’t drop. Even the generic Decepticons still look authentic, probably more so than their 1980s counterparts. Further on into the game you then encounter the big guns, such as Megatron and Devastator. The difficulty of each encounter is well balanced, and steadily increases as you progress, acquiring additional weaponry and alternative moves. The linear set up keeps you on the straight and narrow, it keeps you on task. But the lack of freedom does become a little repetitive, especially in a time when open world exploration is commonplace does seem restrictive. There were times when I simply wanted to break out from the current pursuit or round of combat and drive around the city randomly taking down Decepticons, either via stealth or by more aggressive methods. Perhaps, hopefully, any follow up to Devastation will utilise something similar. The combat set up could benefit from some additional fluidity, such as using the surrounding environment to your benefit. Previous Transformers games, the Michael Bay movie adaptations in particular, provided a more open approach that included using the building as a launch point for attacks, or somewhere to dart behind if your current tactics needed a re-think. A multiplayer focused alternative would prove hugely enjoyable, especially when encountering Devastator. And being able to play as both sides could help expand the campaign. Devastation is the first Transformers game to look back at what made the franchise popular when it was first released and it uses this to great effect. Nostalgia is not in short supply here. But there are areas when a little more polish and versatility would turn this fun-filled release into a truly superb one. Next Post Destiny: The Taken King – A Story Redeemed?